Years ago I had a PDA. About the only thing that worked properly on it was “Bubble Breaker” and I became hooked on this simple but addictive game. 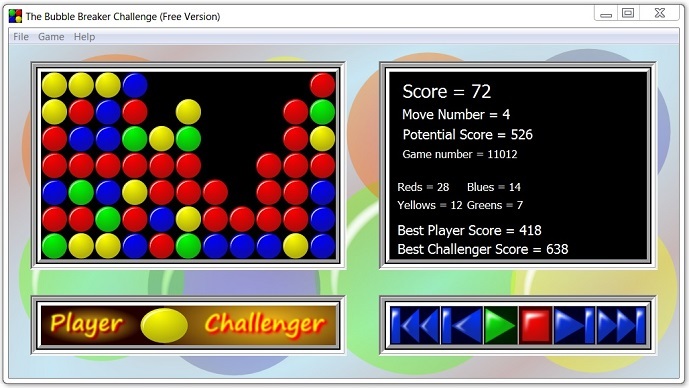 I also began to experiment with computer programs to play bubble breaker. The Bubble Breaker Challenge is absolutely free so download it now – just click the button below. Switch between your game (the Player) and the computer’s (The Challenger). Undo back to the start of the game. Numbered games – share the good ones with your friends. Any number of bubbles – any width * any height up to 100 on a side. Up to eight colours of bubble. Register your interest now at bubble@chrispidd.com and get 20% off the price. In addition, anybody emailing useful suggestions and features to be included in the Pro version of the Bubble Breaker Challenge, will receive the “Bubble Breaker Challenge Pro” for free.